"Imagine if you could say anything or do anything, with the odds of getting caught being almost nil. Even if you are apprehended, there would be little, if any, repercussions." Welcome to The Book of Broken Promises: $400 Billion Broadband Scandal & Free the Net". It is being pre-released as a PDF version because these are critical times in communications. It is the third book in a trilogy that started in 1998 and it details some of the largest scandals in American telecommunications history. So let me tell you a story, which is told in all of its gory details in the book. By the end of 2014, America will have been charged about $400 billion by the local phone incumbents, Verizon, AT&T and CenturyLink, for a fiber optic future that never showed up. And though it varies by state, counting the taxes, fees and surcharges that you have paid every month (many of these fees are actually revenues to the company or taxes on the company that you paid), it comes to about $4000-$5000.00 per household from 1992-2014, and that's the low number. You were also charged about nine times to wire the schools and libraries via state and federal plans designed to help the phone and cable companies. And if that doesn't bother you, by year-end of 2010, and based on the commitments made by the phone companies in their press statements, filings on the state and federal level, and the state-based 'alternative regulation' plans that were put in place to charge you for broadband upgrades of the telephone company wire in your home, business, as well as the schools and libraries -- America, should have been the world's first fully fibered, leading edge broadband nation. In fact, in 1992, the speed of broadband, as detailed in state laws, was 45 Mbps in both directions -- by 2014, all of us should have been enjoying gigabit speeds (1000 Mbps). Instead, America is not number 1 or 2 or 5 or even 10th in the world in broadband. As of Monday, September 15th, 2014, one of the standard testing companies of the speed of broadband, worldwide, Net Index by Ookla, pegged America at 25th in the world in download speeds and 40th in upload speeds. Though this accounting varies daily, America's download speeds are never in the top 20 countries. There is a wire that goes into your home, school or office as everyone in America is entitled to phone service. This was based on a copper wire that was put in as part of the state-based utility and most of them are controlled by what are now AT&T, Verizon and Centurylink. And these networks were aging as almost all of America had been wired for phone service by the 1960's. Starting in 1990s, (though it varies by state), this copper wire was supposed to be replaced with a fiber optic wire, which would allow for new innovative services, not to mention cable TV and video. And it was always supposed to be an upgrade of the state-based utility known as the "PSTN", the "Public Switched Telephone Networks". It was also supposed to be open to all manner of competition. You, the customer, would choose who offered you Internet, cable, broadband and even phone service over that wire. And like fresh blood in shark infested waters, what are now AT&T, Verizon and Centurylink claimed that if they were given more money, they would use it, state-by-state, to wire whole states, not to mention the schools and libraries, or both. 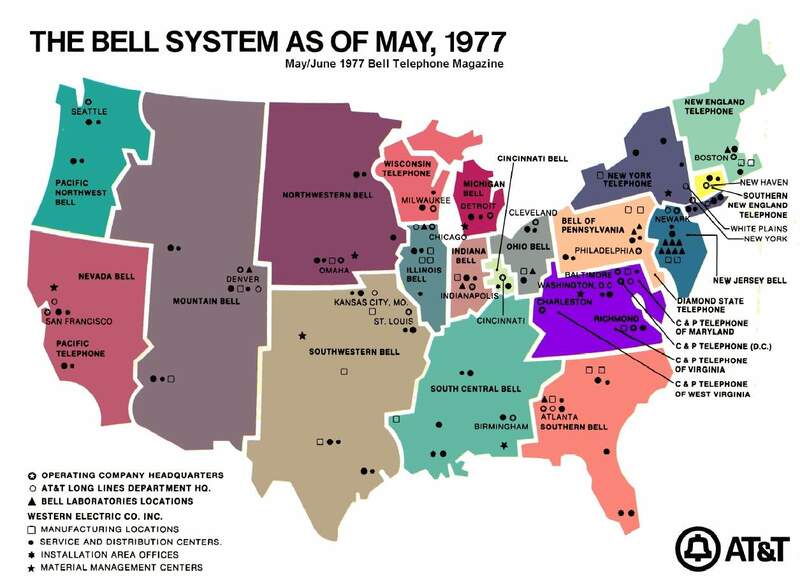 NOTE: At the time, there were seven 'Baby Bells', which were created in 1984, when Ma Bell, the original AT&T, was broken up. These included Ameritech, Bell Atlantic, BellSouth, NYNEX, Pacific Telesis, Southwestern Bell (renamed SBC) and US West. There were also some independent companies, like GTE and SNET (Connecticut). But, by 2007, the companies had all merged to what we have today, and the original AT&T was eaten by its own children. SEE MAPS: Before the break up, the creation of the "Baby Bells" and after the mergers. By the 1990s, the 'Era of Say Anything' was in full swing with grandiose plans. In 1993, Pacific Bell, California, said it would spend $16 billion by 2000 and have 5.5 million homes wired with fiber optics. Bell Atlantic controlled the East Coast states from New Jersey through Virginia and claimed it would spend $11 billion on 8.75 million homes by 2000, while Ameritech (which included Ohio, Indiana, Illinois, Michigan and Wisconsin) stated it would have 6 million fiber optic lines by 2000. Some states, like New Jersey, would have 100% of Verizon New Jersey's territory completed by 2010 with 45 Mbps services in both directions, while SNET (Connecticut) said it would spend $4.5 billion and have 100% completed by 2007. Ohio Bell, (now AT&T Ohio) claimed that 100% of schools and libraries would be upgraded to fiber by 2000. And US West, (now Centurylink) which controls many western states, like Wyoming, Idaho, Colorado or North Dakota, told the public, regulators and investors that it would start a major deployment of fiber optic services, adding ½ million households a year. Alongside of this, the companies filed with the FCC to offer something called "Video-Dialtone", which was to be able to use the phone networks to offer cable and video services. And almost every company filed to offer millions of customers services by 2000. And these deployments matched the state-based commitments. And all of these announcements were in the companies' annual reports, statements to the press, or in state and federal filings; and it was always fiber optics and it would deliver broadband with speeds of 45 Mbps in both directions, and it included a cornucopia of new services, from interactive video and 500 channels of cable TV, to tele-medicine and tele-commuting (but would end up being 'tell-them-whatever-they-wanted-to-hear'). But there was a catch... Who would pay for it? Well, you, your business, your school, libraries -- anyone with phone service would be paying for these upgrades over and over and over. Starting in 1991, there were discussions of whether the government should build these networks, but the phone companies who controlled the state-based utilities in every state, saw this as a new mountain of money and said -- just give us a little more profit via deregulation (known as 'alternative regulations'), and we will, of course, upgrade these networks. At this time, the companies' wires were still monopoly controlled and the networks were closed to competition, so their profits were constrained to 12-14% a year. But, within literally a year after the laws were changed, the profits more than doubled to about 30%, (though it varied by state and phone company). By 1995, almost every state had granted some form of alternative regulations that lifted the profit ceiling on most of the services. For example, Call Waiting and Call Forwarding were new services in the 1990's. It cost the company less than penny to offer Call Waiting, and the other 'calling features' cost the company pennies, but they could charge $4.00-$7.00 on each service -- and when you throw in everything from 'non-published' numbers to inside wire maintenance, all of this was new found cash. The Bell companies were also able to take massive tax write-offs. From 1993-1995, the companies took $25 billion in depreciation write offs, and were able to 'speed up' the tax deductions they could take as they claimed they would be replacing the aging copper wires with fiber optics. But, as soon as the ink was dry on the new laws, the companies knew they would never be held accountable to fulfill these commitments to do these upgrades of the state utility networks; nothing was built, nothing was upgraded. There was more fiber in a bowl of cereal than fiber wires connecting homes, businesses or schools. Some states, like SNET (Connecticut) or the Ameritech states, started rolling out fiber optic services for vanilla cable service vs the committed 500+ channels of programming. However, these were all short-lived and all of these deployments would also be chopped; closed as soon as the companies began merging to create what is now AT&T and Verizon. SBC, (originally Southwestern Bell and now AT&T) led by Ed "The Hatchet" Whitacre, started the merger mania to marry the other 'Bells' -- and we all know that it is an act against nature when siblings marry. SBC started off with Pacific Telesis (California and Nevada) and that plan to spend $16 billion dollars for 5.5 million fiber optic households was the first to go in 1997. SBC then took over SNET and shut down its cable services, and then merged with Ameritech, and the broadband/cable properties that had started to be built were sold off to WOW, a small cable company, post 2000. No state ever went back and either changed the laws to stop the customer overcharging or got refunds for the failure to do the upgrades. Some state advocate offices tried, but today, in virtually every state, the excess phone charges and tax perks are still being charged and hidden in the cost of the myriad of services, from Caller ID to even basic phone rates. And since that time, (1991-2004), there have been many other increases in every state, as well as increases and additions to the taxes, fees and surcharges. But I'll get to that in future articles. Instead of upgrading the old, copper, legacy utility networks to fiber optics, ALL of the companies pulled a bait and switch and around 1998 or later, rolled out ADSL over these aging copper wires. It was slow and it was considered an inferior product in 1992; it was the reason why the companies had pitched fiber optics as fiber can handle much higher speeds and has a larger capacity to handle video services. Because of this bait and switch, instead of investing in the networks, the companies invested overseas or built other businesses, like wireless, that should have been used to upgrade the utility networks to fiber optics -- I.e., we paid for a broadband utility network that was open to all forms of competition and you should have been able to choose your Internet, broadband, cable and phone service providers over the upgraded wires. What about AT&T's U-Verse or Verizon's FiOS, or the cable companies, or wireless or...? The Book of Broken Promises goes from the 1990s through September 2014 and lays out all of the broken promises that were used to charge you more money for services you never got, or to push through mergers where the commitments were just made up, or the 'Say Anythings' used to get new deregulation. And it covers everything from Net Neutrality and the proposed mergers of AT&T-Direct TV and Time Warner-Comcast, to the cable companies' "Social Contract", which was a plan to charge customers more to wire the schools, which is still being collected today. And to bring this all full circle, the book also explains the current plans of AT&T and Verizon to dismantle the remaining utilities and shut off 25-50% of their territories' (AT&T controls 22 states) wired networks while migrating customers to their own, more expensive, wireless service -- instead of upgrading the wired networks. Also, this isn't simply a history lesson or cautionary tale. We found new, unexamined documents, financials and other materials that have not been made public -- yet. Using the extensive data and analysis presented, the book ends with a plan for next steps, including solving Net Neutrality issues -- which I will feature in upcoming stories. Ironically, (or sadly), I have told the story of the failed, fiber optic broadband deployments in America over and over. It appears in the first book of this trilogy, "The Unauthorized Bio of the Baby Bells & Info-Scandal", published in 1998, with Foreword by Dr. Robert Metcalfe, the co-inventor of Ethernet (computer networking), and this story was extensively detailed in the second book, "$200 Billion Broadband Scandal", published in 2005 and featured on Bill Moyer's Emmy-nominated PBS special "The Net at Risk", which aired in 2006. It is being pre-released as a PDF version for only $2.99; the printed paperback and epub version will be released in October 2014. Click to order the book, read the introduction and what's covered in this expose, or to learn more about the two previous books in the trilogy. And all I have to add is -- "I told you so..."